We announced Amazon Elastic Container Service for Kubernetes and invited customers to take a look at a preview during re:Invent 2017. 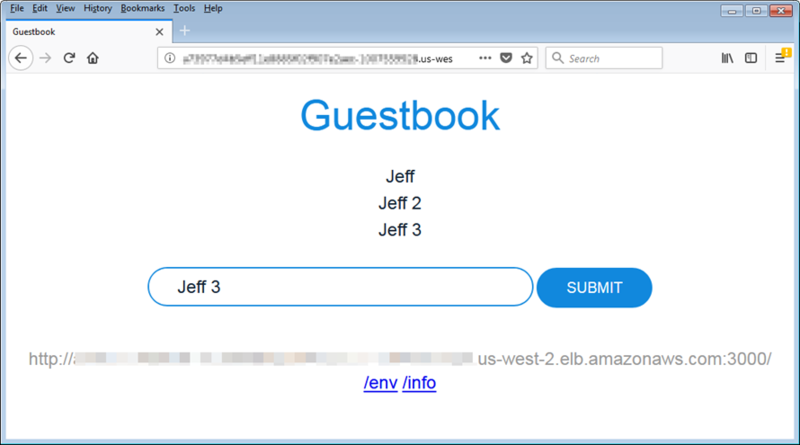 Today I am pleased to be able to let you know that Amazon EKS is available for use in production form. 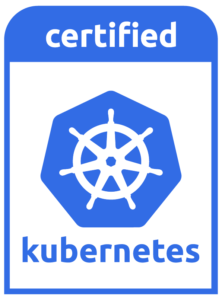 It has been certified as Kubernetes conformant, and is ready to run your existing Kubernetes workloads. Based on the most recent data from the Cloud Native Computing Foundation, we know that AWS is the leading environment for Kubernetes, with 57% of all companies who run Kubernetes choosing to do so on AWS. Customers tell us that Kubernetes is core to their IT strategy, and are already running hundreds of millions of containers on AWS every week. Amazon EKS simplifies the process of building, securing, operating, and maintaining Kubernetes clusters, and brings the benefits of container-based computing to organizations that want to focus on building applications instead of setting up a Kubernetes cluster from scratch. 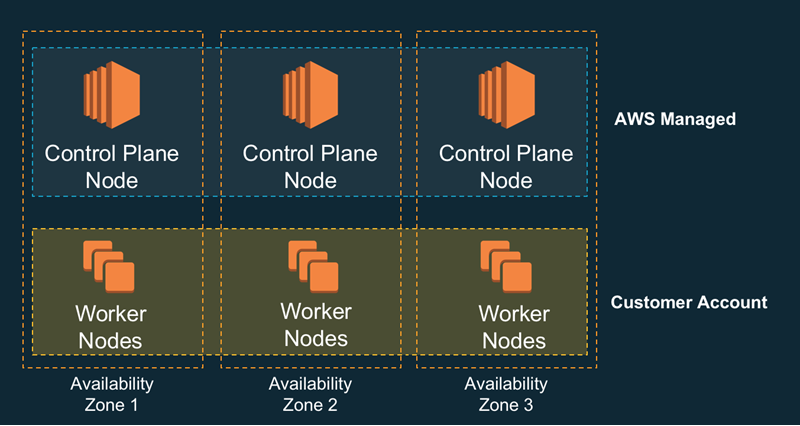 Multi-AZ – The Kubernetes control plane (the API server and the etcd database) are run in high-availability fashion across three AWS Availability Zones. Control plane nodes are monitored and replaced if they fail, and are also patched and updated automatically. 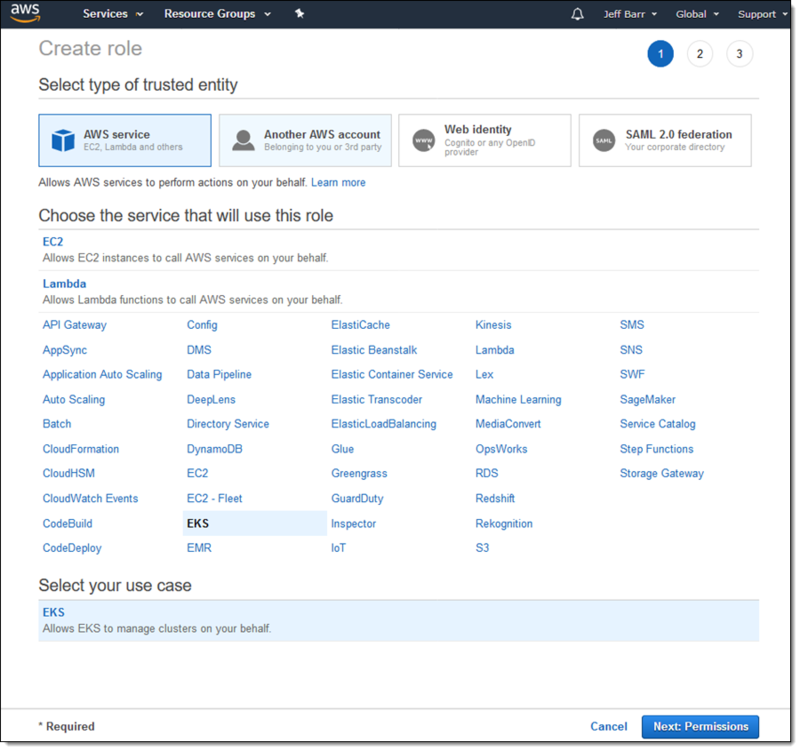 IAM Integration – Amazon EKS uses the Heptio Authenticator for authentication. You can make use of IAM roles and avoid the pain that comes with managing yet another set of credentials. 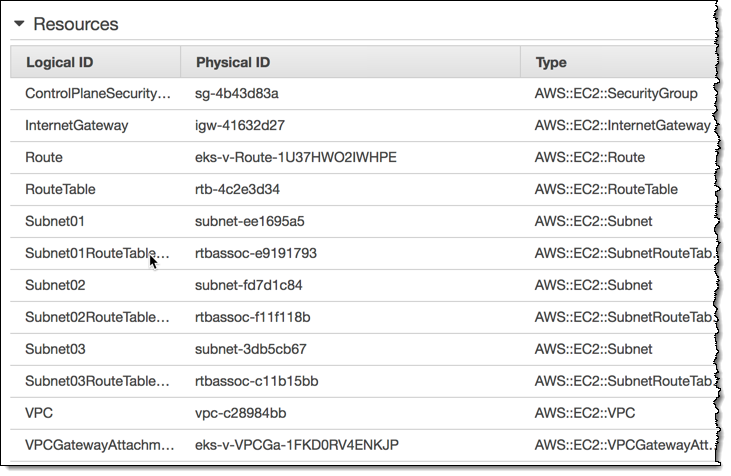 Load Balancer Support – You can route traffic to your worker nodes using the AWS Network Load Balancer, the AWS Application Load Balancer, or the original (classic) Elastic Load Balancer. EBS – Kubernetes PersistentVolumes (used for cluster storage) are implemented as Amazon Elastic Block Store (EBS) volumes. Route 53 – The External DNS project allows services in Kubernetes clusters to be accessed via Route 53 DNS records. This simplifies service discovery and supports load balancing. Auto Scaling – Your clusters can make use of Auto Scaling, growing and shrinking in response to changes in load. Container Interface – The Container Network Interface for Kubernetes uses Elastic Network Interfaces to provide secondary IP addresses for Kubernetes Pods. For a more detailed look at these features, read about Amazon Elastic Container Service for Kubernetes. 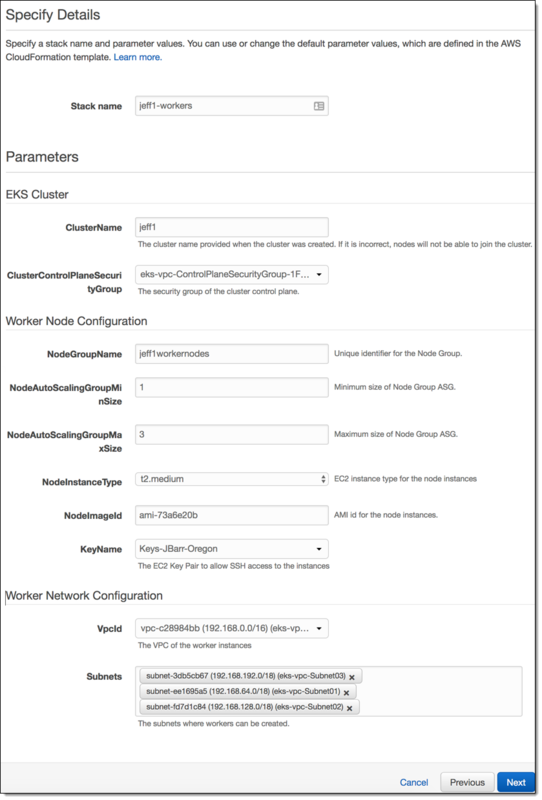 To create a cluster, I provision the control plane, provision and connect the worker cluster, and launch my containers. 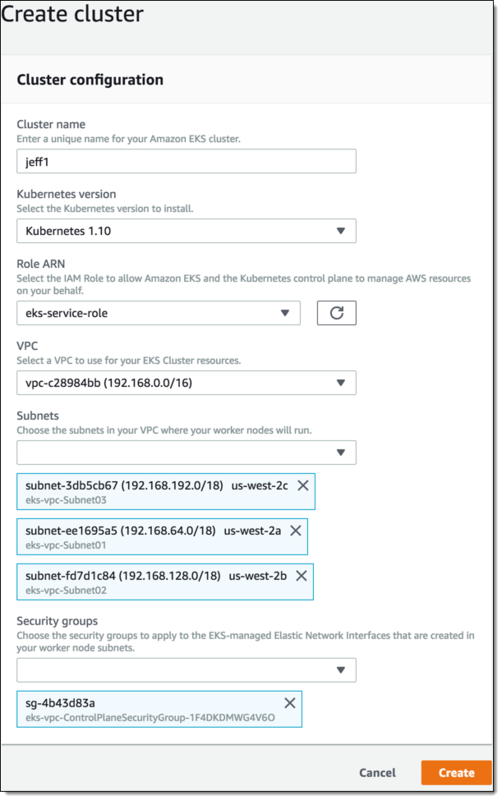 In the example below I will create a new VPC for my worker cluster, but I can also use an existing one, as long as the desired subnets are tagged with the name of my Kubernetes cluster. Next, I download kubectl and set it up to use the Heptio Authenticator. The authenticator allows kubectl to make use of IAM authentication when it accesses my Kubernetes clusters. Instructions for downloading and setup are in the Getting Started Guide and I follow them as directed. 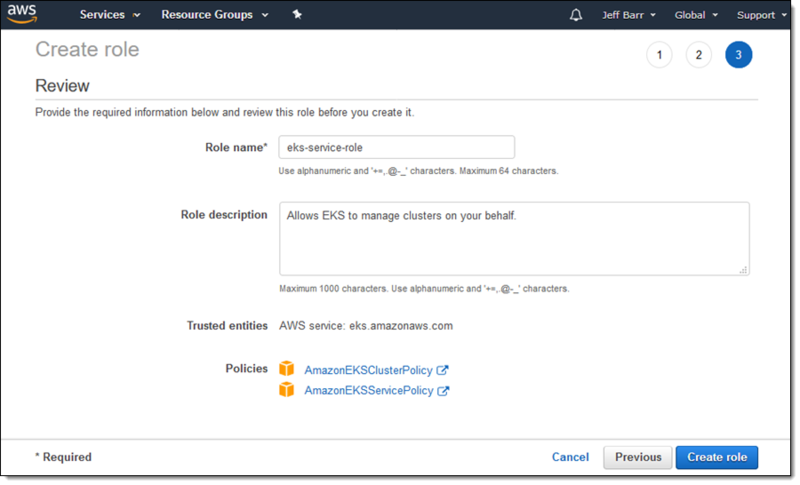 With my IAM role, my VPC, and my tooling all in place, I am ready to create my first Amazon EKS cluster! This command returns a long string of data that I’ll need in a minute. - name: aws user: exec: apiVersion: client.authentication.k8s.io/v1alpha1 command: heptio-authenticator-aws args: - "token" - "-i" - "jeff1"
We make upstream contributions to the Kubernetes repo and to projects such as the CNI Plugin, the Heptio AWS Authenticator, and Virtual Kubelet. We are currently looking for Systems Development Engineers, DevOps Engineers, Product Managers, and Solution Architects with Kubernetes experience; check out the full list of open positions to learn more. Amazon EKS is available today in the US East (N. Virginia) and US West (Oregon) Regions and will be expanding to others very soon. We have a detailed roadmap and plan to crank out plenty of additional features this year. You pay $0.20 per hour for the EKS Control Plane, and usual EC2, EBS, and Load Balancing prices for resources that run in your account. See the EKS Pricing page for more information. PS – Special thanks to my colleague Tiffany Jernigan, for supplying me with an updated set of screen shots!